Johann Balthasar Kehl (1724 - 1778) was a German organist, cellist and composer. A few months ago I started a series with Kehl's choral preludes, but only uploaded one piece. So it's time to continue. 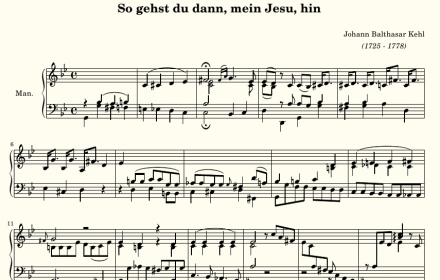 The choral "So gehst du nun mein Jesu hin" depicts the time of. 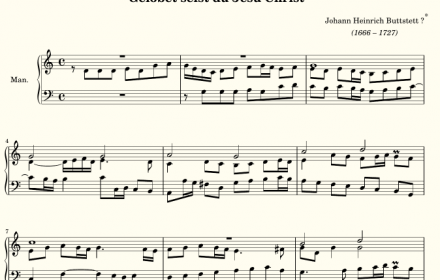 Johann Schneider (1702 - 1788) was a German organist, violinist and composer. He was born in Oberlauter in Coburg as son of a miller. His musical training began at age 6. The first 8 years he was taught keyboard and composition by Nicolaus Müller. After that folowed three yeaurs of. Lohet's Nona fuga has a far more subdued character than most of the preceeding fugues. I think it can best be played with use of the pedals. 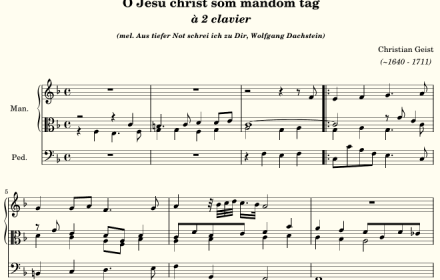 But I made a manuals-only version as well The recording was done on the sample set of the Silbermann organ of the Stadtkirche Zöblitz. 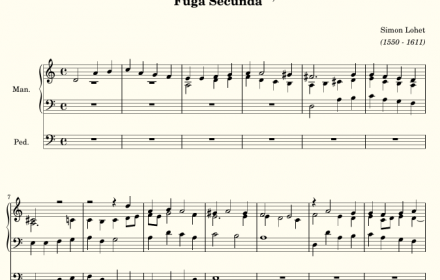 Lohet's Septima Fuga is actually two small fugues in one piece. Two different (but related) themes each get an exposition and then the fugue is over. Yet it is a pleasant dance like piece, like most of these fugues from Lohet. The recording was done on the sample set of. 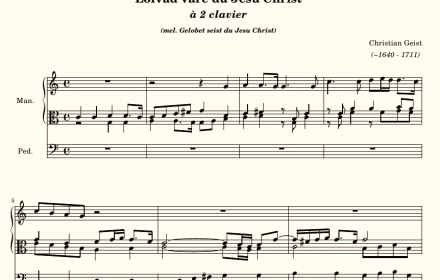 The third and last work by Christian Geist in the Uppsala manuscript is a choral prelude on "Lofvad vare du Jesu Christ", in other parts of the world known as "Gelobet seist du Jesu Christ". It is again a fine example of the Northern German organ style. The original is. 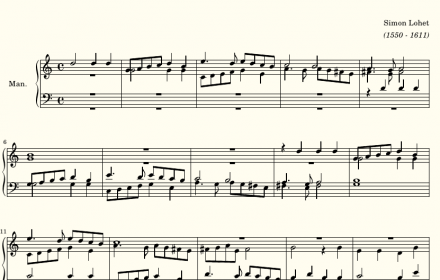 Lohet's sixth fugue, though short, uses contrapuntal devices as stretto and diminution and combines them as well. In that respect it is more modern than the fifth fugue. The harmonic progression though is in places still quite 'old'. The recording was done with the sampleset, made by Sonus Paradis, of. 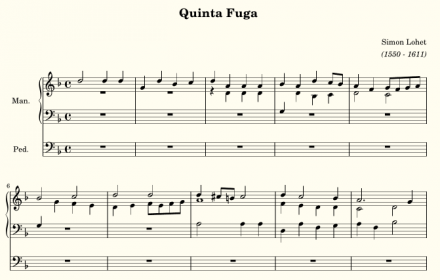 Lohet's Quinta Fuga (I follow the designation in the original Edition, instead of naming it Fuga Quinta) shows its Renaissance roots more than the previous four. 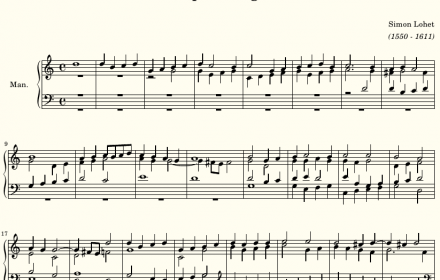 It uses frequent repeated chords, a device we nowadays don't associate with the contrapuntal style of a fugue. And it uses (again) frequent parallel. 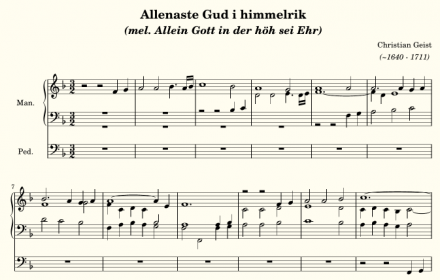 The second chorale prelude by (presumebly) Christian Geist in the Uppsala manuscript uses the melody Wolfgang Dachstein wrote for "Aus tiefer Not schrei ich zu Dir". It is a fine example of the Northern German organ style. If anyone would have told me it was written by Buxtehude, I would. 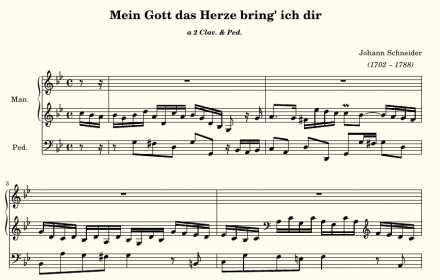 Christian Geist (c. 1640 – 1711) was a German composer and organist, who lived and worked mainly in Scandinavia. He was born in Güstrow, where his father, Joachim Geist, was cantor at the cathedral school. In 1670 Geist moved to the Swedish court orchestra under Gustaf Düben the elder (ca.. 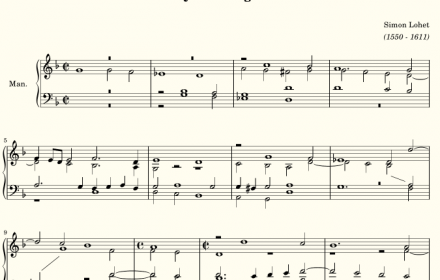 The fourth fugue of Simon Lohet offers a few surprises. At least to me. Firstly, parallel fifths and parallel octaves apparently weren't as 'forbidden' in Lohet's days as they became in later years. 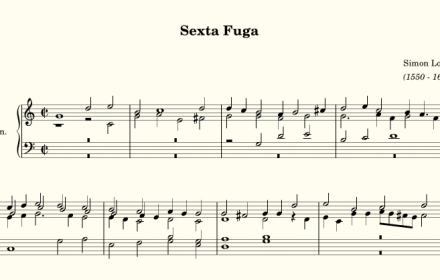 In this fugue there are some blatant examples of them, as well as in later fugues. And. 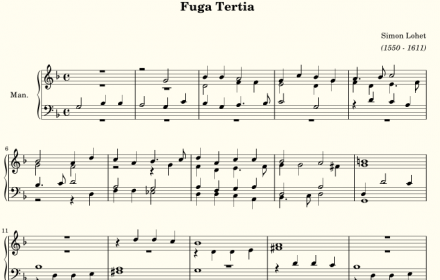 The third fugue of Lohet from Johann Woltz’s Nova musices organicae tabulatura (Basel, 1617). The recording was done with the sampleset, made by Organ Art Media, of the Arp Schnitger organ in Steinkirchen. Score Lohet, Fuga. 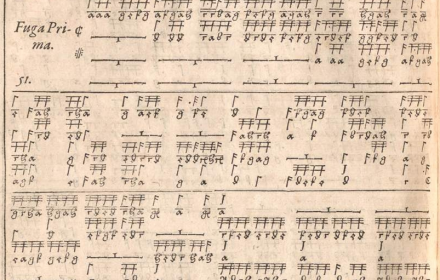 The second fugue of Lohet from Johann Woltz’s Nova musices organicae tabulatura (Basel, 1617). The harmonic progression in this second fugue sometimes sounds a bit strange to our "modern" ears. But for the largest part it sounds like it was written decades later. 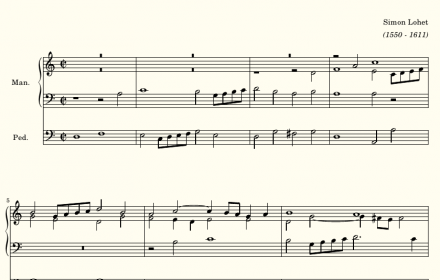 Transcribing these fugues is already my pet. A little left over from the Christmas period. I forgot to post this one three weeks ago. I could wait till the end of this year, but chances are I'd have forgotten this piece altogether. The manuscript gives no composer for this piece. But since the preceding piece in the manuscript. Simon Lohet (Loxhay) (c. 1550 – 1611) was a Flemish composer, possibly born in Maastricht. During his live he was mostly active in Germany. He was organist of the Württemberg court of count Louis VI. Lohet made several trips to the Low Countries in the 1570s and to Venice in.